Did Skye Just Become The Biggest Badass On Agents Of SHIELD? Truly, this is a time of miracles. First Ward, who was so boring he actually made fun of himself for being boring, became the most fascinating character. And now Skye, whom the show had to keep telling us was awesome, is suddenly being a total straight-up badass. Meanwhile, Coulson continues to suffer. Yay. Part of the entertainment of SHIELD, at this point, is watching the denial chip away piece by piece. Coulson still hasn't quite gotten it through his head that the organization he served all this time no longer exists or is viewed as indistinguishable from Hydra. In this episode, we discover that Maria Hill has gone to work for Tony Stark and is cutting deals with the U.S. government to hand over intel. So in this episode, Coulson keeps getting knocked back by how on his own he is — even apart from finding Koenig's dead body and realizing that Ward is a Hydra agent who's taken Skye with him. He is blindsided when Maria Hill leads Col. Talbott's goons to the Providence base and throws Coulson and his people to the wolves. He keeps thinking that they can call for backup to go after Ward — but there is no backup. To the authorities, Coulson and Ward are the same, until Coulson proves otherwise by coming clean. The rest of the team only just realizes in this episode that Ward is Hydra, and it hits them hard — at one point, Coulson says he'll freak out about this later, but it's clear he's freaking out on the inside. Fitz, the one who least wants everything to change, is the most resistant to accepting the truth, even after he finds a message that says "WARD IS HYDRA" hidden on the base. None of them wants to accept they've been played that badly. But the person who handles the Ward reveal with the most aplomb, and yet who totally serves contempt to Ward raw and cold, is Skye. The way she plays Ward in this episode is really beautiful to watch. She gets him to fly to L.A., pretending that the hard-drive's encryption is geo-locked to the diner where she met Mike Peterson. And then she keeps stalling. She's not as good as Ward at pretending to be something she's not, so she uses the shock of the Hydra reveal and the fall of SHIELD to cover up what's really upsetting her. And she keeps finding ways to dig at Ward without giving up the game. All the scenes where he's growing more suspicious and she's just using his suspicion and twitchiness to twist the knife further are just great — his desire to keep their S.O.-trainee relationship and their budding romance allow her to play him while also making him squirm. It all culminates in the great scene above, where the build-up is note perfect, her calling him on his lie that he killed Garrett — and also using Garrett's treachery to comment on Ward's. Until she finally reveals that she tipped off the cops about Ward, with a beautiful "hail Hydra." Later, when Ward tries to get romantic with her, her response mirrors ours: "I'm going to throw up." The more she sticks it to him, the more Ward unravels and becomes the self-serving creep he always was. You especially have to love Skye calling Hydra what they are — Nazis — while Grant tries to pretend that that was the old Hydra and this is the new, awesome Hydra that's just about holding hands and singing campfire songs or something. It's interesting to see the parallels between last night's episode and the show's pilot. Not just the parallel conversations in the diner — Skye trying to convince Mike Peterson he's a hero, versus her exposing that Ward isn't. But also, the climax of the episode being Coulson flying along in Lola, his awesome midlife crisis car. But most of all, the crux being that someone has captured Skye and wants her cooperation — but instead of administering truth drug/torture to Skye, her captor administers it to Ward. In the first episode, that gesture gains Skye's trust because she gets to interrogate one of her captors — but here it just plays on her last sympathy for her former friend. 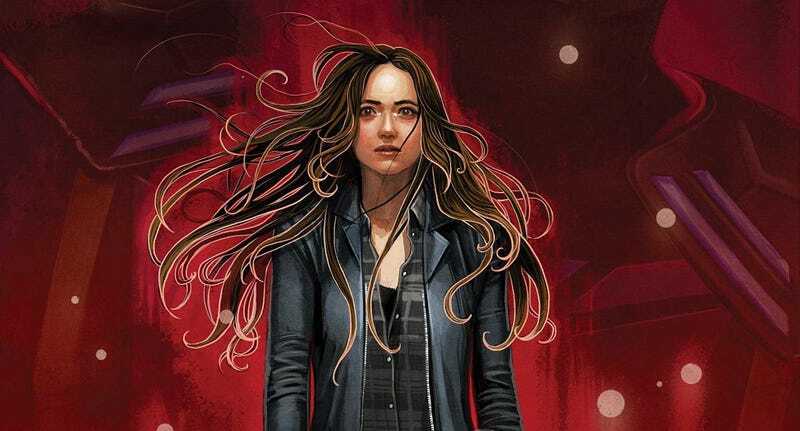 Skye is less successful at managing Deathlok aka Mike Peterson than she was at handling Ward — because she entrusted Mike's son to SHIELD, he's now in the hands of Hydra. So Mike has to play ball or his kid dies. Plus he's got one of those bombs in his head, and they can see if he tries anything remotely funny. So at last Coulson shows up and rescues Skye, with the aforementioned flying-car sequence. Too bad Skye has already decrypted the hard drive — although she left the Hydra goons a nasty surprise. Meanwhile, Coulson's team continues to fray at the edges — there's the aforementioned attack by Talbott, who wants them all to surrender and be interrogated and bargain for their lives with secrets. There's the Ward fallout. But there's also the sense that they're only here by choice — even the word "agent," as Talbott says, implies the existence of an organization that is now illegitimate. They all think Melinda May has abandoned them, and Simmons keeps making noises about how Coulson's orders don't really come from anyone or anything. Perhaps surprisingly, it's the team's outsider, Triplett, who's the most steadfast. He still believes he has a duty, and he still accepts Coulson's leadership. If Melinda May did leave them, then she's a deserter in Triplett's eyes. He is happy to hang out by the pool and eat junk food until the next assignment — but he's still waiting for the next assignment, and despite Garrett's treachery he has not changed his mind about anything. At last, May finds who was in charge of the program that brought Coulson back from the dead: Coulson himself. There's a video of him telling Fury that the program should be abandoned because this resurrection process tends to cause insanity, graphomania, aphasia, dementia and general brain-sproing. The only thing that might help is what they actually did to Coulson himself: implanting false memories. Coulson seems stunned by this reveal — although did anybody else wish the video had shown him being gung-ho and saying the program was in great shape and they should rush forward with testing, instead? That's the only thing that would have given this knife one extra twist.